(Chris Detrick | The Salt Lake Tribune) Salt Lake County Sheriff Rosie Rivera speaks during a community meeting at Kearns High School Thursday, September 21, 2017. Staffing shortages are already hurting the Salt Lake County jail. But Sheriff Rosie Rivera told County Council members that the shortages could get worse before they get any better. Salt Lake County needs to offer its deputies working at the jail better pay and benefits, Rivera said, amid shortages that are preventing it from using the money it’s set aside to open and use an already-built but largely vacant Oxbow jail. Rivera replaced Jim Winder, who rallied the county to expand its jail capacity on his way out the door for a new job as Moab’s police chief. And while the council agreed to spend $7.4 million to help open 368 beds in the Oxbow jail, the county is struggling to attract enough employees to run the lockup. There’s a statewide shortage of law enforcement officers, including at the jails in Salt Lake County. Rivera said she needs 78 additional deputies and better wages and benefits if she is to bring to Oxbow the inmates who have been disbursed to counties along the Wasatch Front. 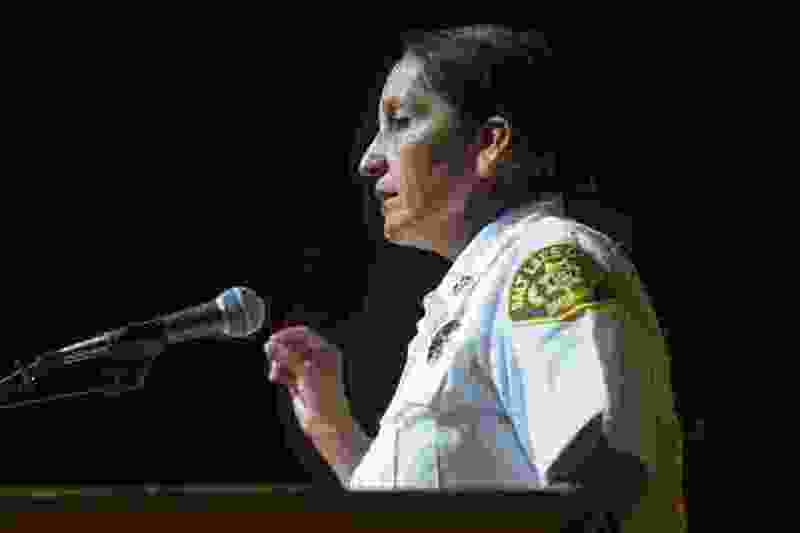 Deputies are leaving the agency for higher-paying jobs at the Salt Lake City Police Department or Unified Police Department, Rivera said. When the economy tanked during the Great Recession, the county froze pay for five years. Deputies can now find jobs that will pay them for the experience they’ve accrued since. The Sheriff’s Office still hopes to run two of three pods at the jail, but it would require officers to work up to 16 hours of overtime each month to oversee 184 beds in the A Pod. That’s the most overtime it allows deputies to work each month, under a policy that aims to prevent burnout of correctional officers. “We are going to have to rely on our staff quite a bit to keep this thing going,” Rivera said. It would have to require deputies to work 24 hours of overtime each month to staff the jail’s A and B pods, according to documents from the department. Deputies currently work four hours of overtime each month, Chief Deputy Kevin Harris said. The Sheriff’s Office is studying how much it will ask for to supplement employee raises and to attract new staffers amid the statewide shortage of about 400 workers. Rivera said other departments offer higher pay, more money into retirement accounts every year and cash bonuses. The county average for hiring officers is 19; 10 of those are hired to replace officers who leave. About 1 in 4 county officers will be eligible for retirement in 2020. The county and state have worked to free up jail beds after years of space limits in Utah’s most populous county. When he was sheriff, Winder set restrictions on the levels of crimes that are eligible for an inmate to be admitted into the Salt Lake County jail, which has a capacity for 2,000 inmates and has been filled since shortly after it was built. Some of those booking restrictions are still in place. Harris said men are booked into the jail only if they’re suspected of committing a class A misdemeanor crime — the highest level of the class of crimes below a felony. Women are booked if they’re suspected of committing a Level 3 felony — the lowest level felony. That likely won’t change even with the additional staffing. But in opening Oxbow, Salt Lake County would be adding treatment beds that would account for about 160 of the 368 at the facility, Harris said. “The intent is to make Oxbow more programming-based,” he said. The sheriff has a friendly ear in the County Council, which includes Deputy Chief Steve DeBry, who leads UPD’s Millcreek Precinct.